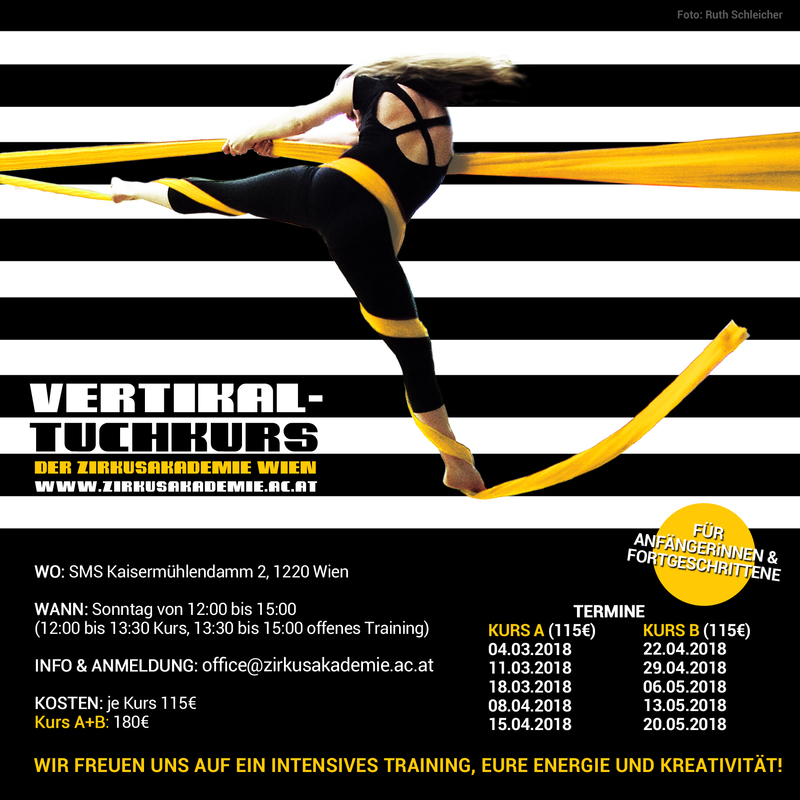 The Zirkusakademie Wien (Circus Academy of Vienna) offers a circus education programme and workshops in Austria. Its two-year programme dispenses a specialisation in either circus pedagogy or circus arts, with courses mostly offered evenings and weekends. It is directed at people who will consider the programme as an addition to their profession or occupation (teachings, dancing, acting etc. ), or as an enrichment to their personal development. 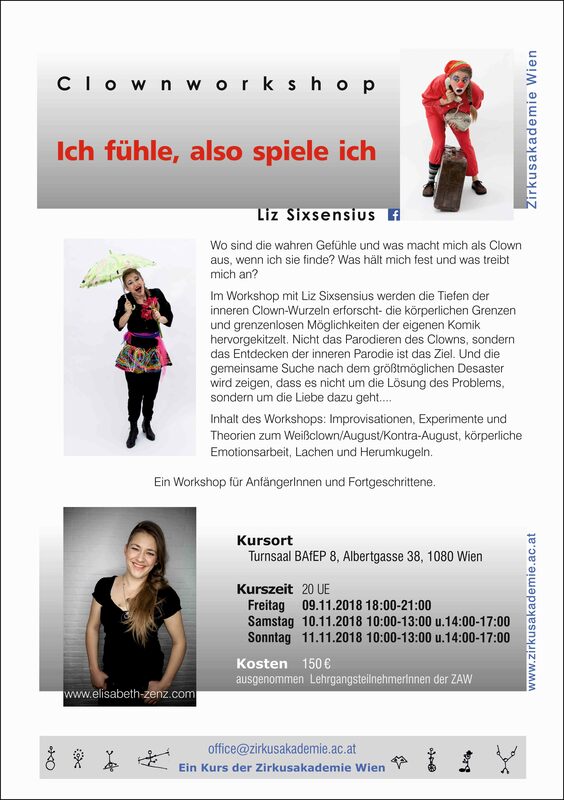 Apart from the two-year programme, the Zirkusakademie Wien (ZAW) offers workshops and courses accessible to the general public. These give people the opportunity to gain an insight into the world of circus, and to learn and train specific circus skills. The ZAW as it exists today was founded in 2001. Our approach is characterized by the nouveau cirque (contemporary circus) that developed from the classical circus during the last quarter century under the influences of dance, acting and music amongst others. The ZAW is certified Wien-Cert and Ö-Cert, meeting the criteria for nationwide quality standards in adult education. As of now t-shirts of the ZAW are available (yes!). You can get them at one of the courses or workshops. The two-year programme provides the foundation in techniques of contemporary circus: acting, acrobatics, dance, and in the more classical arts such as juggling, balancing and aerials. The programme consists of 840 credits (Unterrichtseinheiten/UE). A working knowledge of German is necessary for the courses, written works and communications could be carried out in English. A new programme starts in October of every year. The programme follows the general university calendar in Austria (October to January and March to June). During the two years participants are expected to take part in two weekly courses, one in the field of Acrobatics and Aerials, and the other in the field of Juggling and Balancing. Intensive workshops on some weekends, to which external participants may sometimes take part, will also be regularly scheduled. These courses form part of the curriculum specific to the two-year programme. They offer the possibility to provide an insight into the different circus disciplines, as well as acquiring new skills based on the students’ personal abilities/capabilities. They are mostly taught by our regular instructors. Classical-illusionist-technique, body work/physical training, sensitization, dramatization of scenes, (theatrical) play in a group and alone, invisible theatre, street theatre. Creative theatre out of nothing, group games and working on scenes, exercises on attentiveness and perception, exercises on flexibility and spontaneity. Collecting personal experiences in the art of failure, finding the clown within yourself. Scarves, balls (throwing, contact and partner juggling), rings, clubs (juggling and manipulation, passing), diabolo, devil sticks. Basic balancing of objects, Chinese plates, tight wire and slack wire, unicycle, rola bola, walking globes, stilts. Basic body control (exercises on physical tension/muscle tone, physical mobilization, strengthening and stretching), floor acrobatics (individual, partner and group acrobatics, health and security). Trapeze, aerial silks, aerial ring, aerial rope, trampoline (basic jumps, introduction to the Russian bar, introduction to the teeter board). Focusing on personal core training area. Theory: pedagogical principles, observation and reflection. Practice with children, teenagers and adults: coaching/supervising, warm-ups, instructing games, health and security. 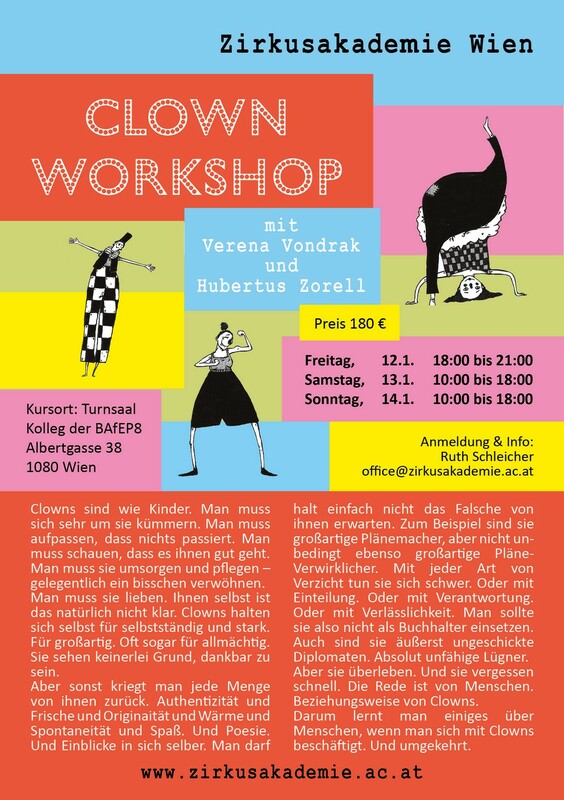 Theoretical concepts of circus theatre, development of a performance/number/act, development of choreographies with children and teenagers, participation in a circus or theatre production. Topic, procedure, methodology and coaching will be individually designed in agreement with the programme administration. 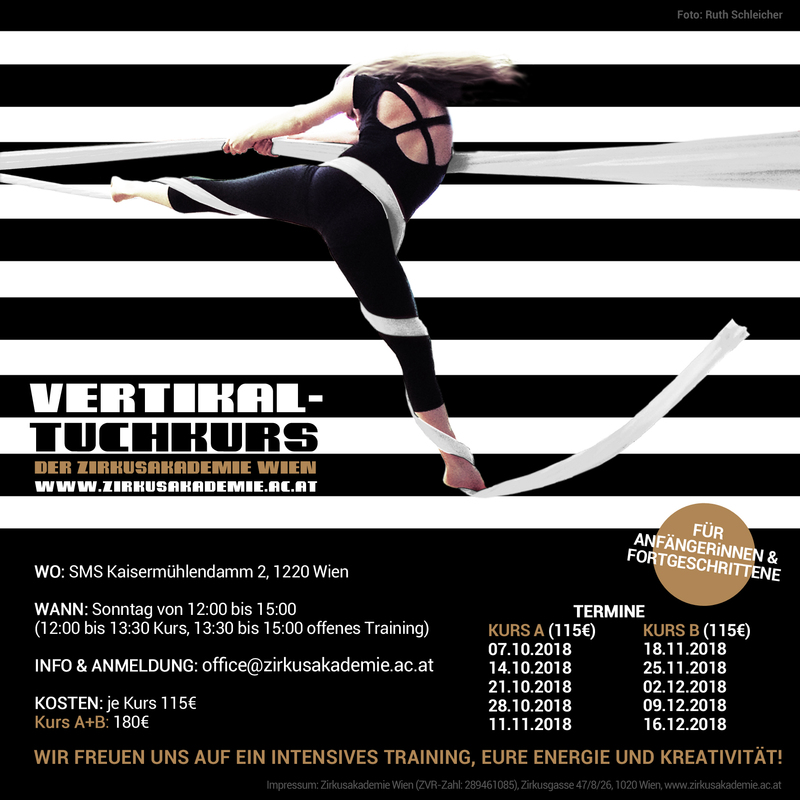 The two-year programme of the Zirkusakademie Wien includes regular courses in the areas of acrobatics and aerials, juggling and balancing as well as physical theatre. These are only offered to the regular students. Anyone is welcome to participate in our open/public workshops. If you aren’t a regular student of the Akademie, please register via the online request form below. Our regular lecturers and instructors come from a variety of backgrounds and offer a wide range of circus experience. We also welcome guest instructors and artists from Europe and abroad for specialised workshops and guest lectures. 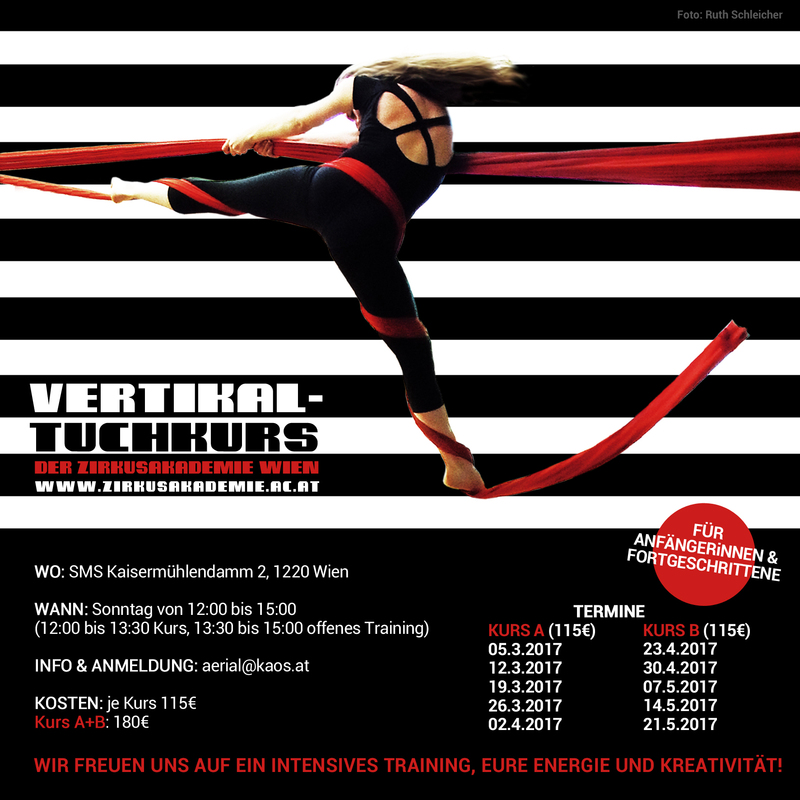 We are a team of dedicated people committed to the advancement of the circus arts in Austria. Don’t hesitate to get a hold of us, we’ll get back to you as soon as we can.